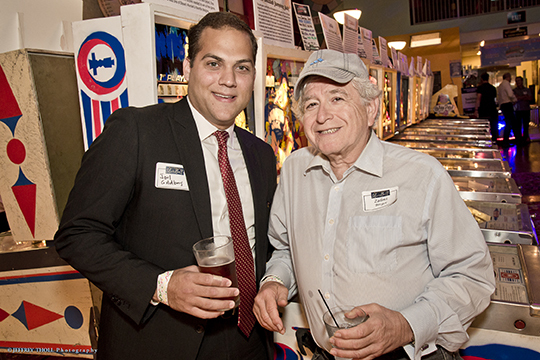 The Men’s Division of the Jewish Federation of South Palm Beach County hosted a great opening event at Silverball Museum in Delray Beach on October 17th. Professionals of all ages passionate about giving back to the Jewish community enjoyed a night of pinball, skee-ball, vintage arcade games, cocktails and hors d'oeuvres. The Men’s Division is co-chaired by Ira Holz, Ken Lebersfeld and Chuck Lichtman. Thank you to our generous sponsors: ESPN and Sandelman Foundation, Men’s Division sponsors; Boca Raton Observer; exclusive magazine sponsor; and Southern Glazer’s Wine and Spirits, in-kind sponsor. For more information about Men’s Division and future events, please contact Arielle Nakdimon at 561.852.6063 or ArielleN@bocafed.org.